The Fourth Kind had its critics because of its defiant portrayal of fiction as fact. This movie is categorized as a 2009 science fiction/horror film, yet it was marketed as a thriller based on a true story. The truth behind the film's well-constructed myths has been widely researched, and these essential facts are at the root of the fictional tale. In The Fourth Kind, many mysterious disappearances are troubling the residents of a small Alaskan town. The mysteries deepen as a concerned psychologist uses hypnosis to help her troubled patients recover their traumatic memories of alien abductions. This psychologist, Dr. Abigail Tyler, gets in over her head, and she discovers that she may have been abducted as well. The Fourth Kind is told with a mix of faux footage, alleged reenactments, and "present-day" dramatization. Even though the film has been dismissed as complete fiction, there is a real story that inspired the tale told in the movie. The facts themselves are sparse, but they do exist. It is very true that there were numerous disappearances from Nome, Alaska, where the film is set. The FBI was actually brought in to investigate them. The FBI concluded that, in most of the cases, the disappearances could be attributed to alcohol and the extreme winter weather in the area. It is also assumed that some of the missing people drowned in the frigid Snake River. Very little information is accessible to the public on these disappearances, which is one of the things that gave The Fourth Kind enough momentum to be advertised as factual. It's agreed upon that several people remain missing to this day. While there is no credit or acknowledgement of his work in the film or its credits, there was a psychiatrist who did investigate alien encounters. In addition to being a psychiatrist, John Edward Mack was a Harvard professor, writer, and researcher. He interviewed those who claimed to be abducted by aliens, and he claimed that many people's experiences with aliens were genuine. This caused much controversy in the academic community, and his unexpected death when he was hit by a speeding car in 2004 left behind many mysteries regarding his research. It is theorized that Dr. Abigail Tyler is a version of the fictionalized Mack, or at least he was likely the inspiration for the character. You may notice that many of the victims' "memories" include a strange language. This language is real, and it's actually ancient Sumerian you're hearing. There is never any explanation for why the aliens are speaking ancient Sumerian instead of the native tongue of the abductees, especially when they're carefully targeting people in a specific area. However, you can count this real language as a fact. In The Fourth Kind, the disturbed patients of Dr. Abigail Tyler have terrifying hallucinations. 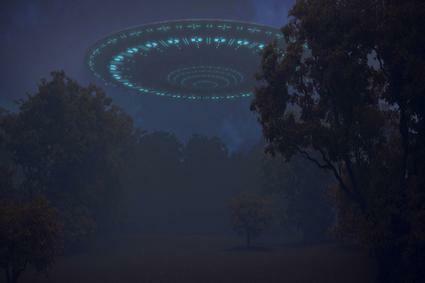 She believes that these hallucinations are actually memories of alien abductions. In reality, those sorts of hallucinations and subsequent behaviors often occur when someone is going through sleep paralysis. For viewers of the film who are not aware of this condition, they may be alarmed by their own xperiences with sleep paralysis and be convinced that this alien abduction theory may fit into their own lives. At least that's the theory of Chris French, a professor of psychology who leads the Anomalistic Psychology Research Unit at Goldsmiths, University of London. Nevertheless, it's a fact that these hallucinations are very real for those experiencing them, just as they were for the characters in this movie. One thing is certainly real within The Fourth Kind, and that's the logo from Chapman University in Orange, California. It was included as an homage to director Olatunde Osunsanmi's alma mater. The catch? It is fictionalized as the alma mater of Dr. Tyler in the movie. After the film's release, a number of people contacted the university to try to track her down. Countless viewers have, indeed, been fooled by the faux footage and strong marketing campaign of the film. Now that you know to be skeptical of the fiction, you may also enjoy the movie in a whole new way now that you know the facts. The Fourth Kind was a hit movie because of its entertainment value, and there's a wealth of frightening fun to be experienced when you watch it. In fact, some may say it's out of this world.